Today is the first day of Copyright Week 2019! Copyright week is an initiative launched by the Electronic Frontier Foundation (EFF) in order to highlight key issues around copyright. Every day, various groups, all defenders of a copyright framework that promotes creativity and innovation, look into specific copyright policy matters. Of course this includes IFLA! Given the central role that copyright plays in libraries’ work, we will be participating by posting a blog post a day. We encourage librarians around the world to do the same by writing and tweeting about #Copyright4Libraries. This first blog of the week looks at what is coming up in 2019 in copyright around the world with a potential impact for libraries. We have gathered information thanks to the IFLA Advisory Committee on Copyright and other Legal Matters and its network. We’ll be following the same model as last year, when we published a first blog focusing on legislation, and a second one on wider trends. Being aware of ongoing copyright reforms is relevant for the advocacy efforts of libraries nationally, regionally and internationally at the World Intellectual Property Organisation. By mapping what is going on, we are better able to provide support to our members in local copyright reforms, and to get a general view of policy trends. We hope that it will also support other advocacy efforts by librarians in all regions of the world. All the information you’ll see below is gathered in an online document, available here. Comments and additional information are very welcome – either contact ariadna.matas[at]ifla.org, or leave your ideas below. You may also be interested in this blog post that we posted before the end of 2018. 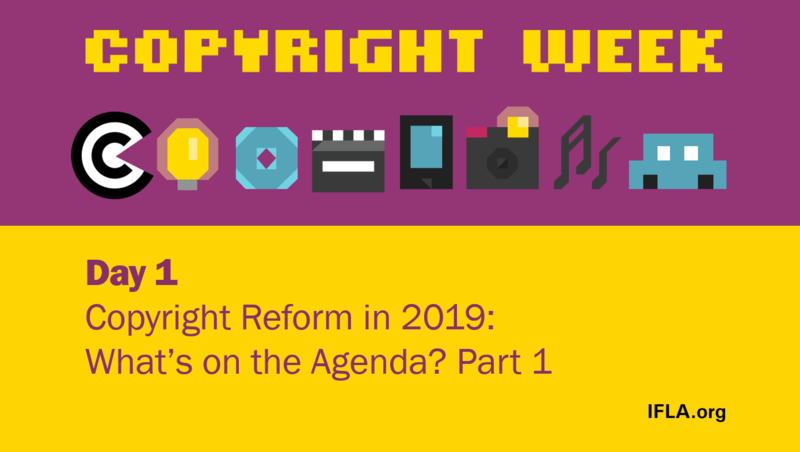 It looks at what happened throughout 2018 and what copyright reforms were finalized. Marrakesh implementation efforts are not included in this overview, but you can check our regularly-updated tables on that matter, available here. There is a 2018 copyright review extended to several sectors including libraries. Mechanisms for investigation of CMO’s and actions against board members. The Nigerian copyright bill was approved by the Cabinet and is now before Parliament. IFLA will be submitting comments once the official approved Bill is available online. The Uganda Law Reform Commission is working on a draft document. It appears like the draft is still closed to the public for discussion. A consultation paper was released in March. It looked mainly at flexible exceptions, access to orphan works and contracting out of copyright exceptions. The Australian LIbraries Copyright Committee’s submission is available here http://libcopyright.org.au/our-work/submission/alcc-submission-copyright-modernisation-consultation. A draft law was published in 2015, and the current status is unclear. There are provisions on foreign protection, and also some regarding libraries and education. The review of New Zealand copyright law continues, with news of Google visits to the country to undertake lobbying. A coverage in Stuff suggests efforts by the company to gain legal recognition for its upload filtering technologies (as may happen in Europe). We are waiting on further updates on legislation, as well as on Marrakesh Ratification, which is also under discussion. There was a first public consultation in October 2016 with 16 proposals, and a second one in May 2017. It is a broad reform, with some steps for libraries and archives: expiry date for copyright protection of unpublished works, use of orphan works, educational exceptions to reflect digital education, facilitating the work of libraries and archives, museums and galleries, provisions for print-disabled users, among others. Text and data mining is also on the table. The Commission proposed a Draft Directive for copyright in the Digital Single Market in 2016. Discussions are ongoing between the Commission, the Parliament and the Council, but close to being finalized. Preliminary agreements have been reached on several exceptions and limitations and on the out of commerce works provisions. The new draft copyright law, published in 2017, was expected to be completed by the end of 2018. It contains provisions for libraries, archives & education, and orphan works. The potentially broad copyright reform is on hold, while waiting for EU legislation on copyright to pass. Israel has recently passed legislation on orphan works which would create welcome new possibilities for libraries, subject to reasonable diligence in a search for rightholders. The copyright working group reached an agreement on various issues related to the modernisation of copyright law in March 2017. The Bill should contain provisions with regards to orphan works, cataloguing, extended collective licensing, secondary right of publication, and implement the Beijing and the Marrakesh treaties. Jan 2018, amendments were approved by the Cabinet of Ministers. There was an impact assessment on balanced goals; allow use of online licenses, freedom of panorama, orphan works and Marrakesh treaty provisions. There was a green paper proposal made to stakeholders with a meeting in December 2016. A public consultation process was open in March 2017 to reform the copyright law. Broad proposals, including on reprographics, preservation, document supply and Marrakesh. Consultations are still ongoing. There was some talk of a review in 2017, and the decree supporting a move towards passing legislation necessary to implement Marrakesh was signed. This could also be an opportunity for further changes in a country that currently has no exceptions and limitations for libraries. We received news on discussions around open access to publicly funded research at Congress in 2018. The copyright bill contains a large number of exceptions (first in Uruguay): for the communication to the public, distribution, interpretation, execution, translation or adaptation of works by educational and research institutions; for reproductions of short extracts of works by educational institutions; for the reproduction of works for an analysis through computer means; for reproductions for preservations or to replace a work by cultural heritage institutions; for the public lending of works, exception for translations by cultural heritage institutions; and for the use of orphan works. The dossier is pending for discussion at the Comisión de Educación y Cultura de la Cámara de Representantes. IFLA has written to encourage progress. The Canadian government launched a copyright review in December 2017. There will most likely be discussions on fair dealing and on the so-called “value gap”. Throughout 2018, the Canadian Parliament continues to carry out its review of the country’s copyright laws, taking evidence from different sides of the debate. Libraries are arguing for the current fair dealing provisions to be safeguarded, as well as engaging in discussions around copyright and indigenous knowledge, technological protection measures, and contract override. In parallel, legal processes involving Canadian universities, education ministries and the reprographic rights collecting society Access Copyright continue, as does a review of how copyright royalties are defined. You can read more on the pages of the Canadian Association of Research Libraries and the Canadian Federation of Library Associations. Results of the review are expected towards the middle of next year and will inform policy choices made by whoever wins the elections due in October 2019. IFLA submitted comments in October 2018: https://www.ifla.org/node/82020. Library/university institutions submitted comments, for instance: CFLA-FCAB http://www.ourcommons.ca/Content/Committee/421/INDU/Brief/BR9921734/br-external/CanadianFederationOfLibraryAssociations-e.pdf; Universities Canada http://www.ourcommons.ca/Content/Committee/421/INDU/Brief/BR10002433/br-external/UniversitiesCanada-e.pdf; or the Canadian Association of Research Libraries http://www.carl-abrc.ca/wp-content/uploads/2018/08/CARL_brief_to_INDU_copyright_en.pdf. Discussions continue around whether the Register of Copyrights (Head of the US Copyright Office) should be a presidential appointment, or rather hired by the Librarian of Congress. The issue was not decided by the previous Congress. The EU is currently negotiating a trade agreement with the four founding members of Mercosur (Argentina, Brazil, Paraguay, and Uruguay). The first negotiation round took place on 11 May 2016, followed by a negotiation round in October 2016. The chapter on intellectual property rights contains some worrying provisions: art. 4.7 sets the term of protection of a literary or artistic work in death+70 years (some of the parties have a shorter term), and art. 4.11 mandates the provision of adequate legal protection against the circumvention of TPMs. There is very little reference to exceptions and limitations (art. 4.10, which only adds temporary reproductions which are part of technological processes). A later version was leaked by Greenpeace. It contains some slight changes on the topic of exceptions and limitations. has a list of mandatory exceptions and limitations (art. 9.9.1): criticism, comment, news reporting, teaching, research, and facilitating access to published works for persons who are blind, visually impaired or otherwise print disabled, and a provision recognising their cross-border effect (9.9.2), both proposals by the Mercosur countries. Each Party may provide for limitations or exceptions to the rights set out in Articles 14.8 to 14.12 only in certain special cases which neither conflict with a normal exploitation of the subject matter nor unreasonably prejudice the legitimate interests of the right holders, in accordance with the conventions and international agreements to which it is party. At least works that are already in the public domain are not going to be brought back under copyright. RCEP is a free trade agreement between the ten member states of the Association of Southeast Asian Nations – ASEAN (Brunei, Cambodia, Indonesia, Laos, Malaysia, Myanmar, the Philippines, Singapore, Thailand, Vietnam) and the six states with which ASEAN has existing free trade agreements (Australia, China, India, Japan, South Korea and New Zealand). The chapter on intellectual property (not sure it is the right document) has been strongly criticised. It only contains a provision on exceptions and limitations similar to the three-step-test, a provision forbidding the circumvention of TPMs, and a provision on the transparency and accountability of CMOs, among a few others. Negotiations have opened on a trade deal between the European Union and Australia. A blog from Rita Matulionyte at the University of Newcastle, Australia, explores the potential impact on copyright, suggesting that the EU is unlikely to have much to ask for beyond the concessions Australia already made as part of its trade deal with the United States. The main area is likely to be platforms where, the blog suggests, the EU may both push for extension of safe harbour provisions to commercial operators, but also application of whatever rules on upload filtering come out of the current copyright reforms within the blog.